Apple iPhone charge problem is very common, here is an iPhone 7 Plus, the problem is this iPhone 7P doesn't charge. When we plugged the iPhone 7 Plus into the computer or wall charger, after a while, the iPhone battery power percentage doesn't increase. 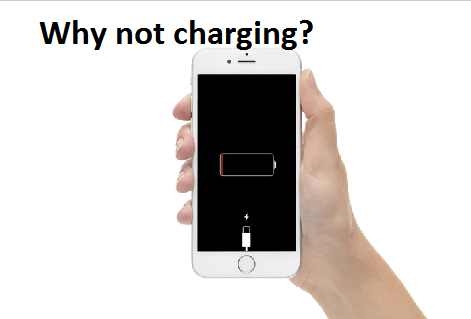 The iPhone charge problem may be caused by software problems, or it may be caused by hardware problems，we will analysis the reasons and provide some reasonable solutions. We can use a small and soft brush or professional dustless cotton swab to clean the iPhone lightning port, and then charge it again. If the iPhone 7P is still not charging, try next solution. If the iPhone charge is bad quality or not working, then it can't charge the iPhone 7 Plus as usual, so we have to make sure the iPhone charger is working. We'd better use original Apple charger or use high-quality charger. There are many iPhone lightning cable in the market, and some of them is very cheap, which means the quality of them is not good. If you are using a cheap lightning cable to charge your iPhone, it will cause the iPhone not charging problem. We'd better use original iPhone lightning cable to charge the iPhone, if the iPhone lightning cable is damaged, we should buy the high quality cable, you can buy a high-quality iPhone lightning cable from other online sources you trust. After confirmed the iPhone lightning port, iPhone charger and iPhone lightning cable are working well, then we should check iPhone software problems, perhaps it's caused by crashed App or iPhone setting problems. We can try to fix it by hard resetting. In order to hard reset iPhone 7 Plus, please press the iPhone power button and iPhone Volume Down button together at least 8 seconds, and then you will see the screen goes blank, when you see the Apple logo reappears, release both buttons. Now, charge the iPhone 7 Plus again, if the iPhone still not charging, please try next solution. The IOS system problem also can cause iPhone not charging problem, we can fix it by updating IOS. Update IOS on iPhone 7 Plus, please go to Settings-> General-> Software Update. Update IOS by iTunes, please connect iPhone to the computer by iPhone lightning cable, and then use iTunes to update IOS. If the iPhone is still not charging, try next solution. If the iPhone 7 Plus has more serious software problems, then we can try to fix by restoring. DFU may let your iPhone charge function back to normal work, because DFU restore can deepest solve iPhone software errors. But you need to back up your iPhone 7 Plus before restore it, because it will erase all data and settings on iPhone. If the iPhone 7 Plus still not charging, then we should detect iPhone battery. If the iPhone battery is damaged, then we can't charge the iPhone smoothly. We can use iPhone battery tester to detect the working condition of the iPhone battery. If all data is normal, then the iPhone battery is good. If the data tested is abnormal, then we can repalce the new iPhone battery. As we know, the iPhone charge IC is very important for iPhone charge function, if the iPhone charge IC is damaged, then we can't recharge iPhone successfully. Disassemble the iPhone 7 Plus, and the take out the iPhone motherboard, put it under the microscope to observe, and measuring it with digital multimeter. If the iPhone charger IC is damaged, then we can fix it by replacing new iPhone charge IC. If it's not the problem of the iPhone charge IC, and the iPhone still not charging, then we should continue to measure the iPhone motherboard, there are still many reasons can cause this problem, such as virtual welding, missing pins, short-circuit and so on. If you can't find out the reason, and you can't fix it by yourself, you can contact Apple or iPhone repair shop to get help. iPhone 6 Keeps Shutting Off,What Should I Do?